When you think of Italian wine, what comes to mind? Chianti? Brunello? Or maybe the thousands of grapes that most of us haven’t heard of. I have one that you need to seek out, and try: Sagrantino. If you were to travel east from Tuscany, you would find yourself in the region of Umbria, which has long been thought of as an appendage of Tuscany. Matter of fact, several of the major players in the wine region, have their home base in Tuscany, and the most planted grape is Sangiovese. But have no doubt, the wines are distinct. The Sagrantino di Montefalco D.O.C.G. (Italian for “controlled designation of origin guaranteed”) produces 100% Sagrantino based wines, which is one of Italy’s least known high quality red wines. There are less than 400 acres of the variety planted, and some of that is interplanted with Sangiovese. The DOCG was created on November 5, 1992, and applies to dry and passito style sweet reds made exclusively from the Sagrantino grape. The D.O.C.G. requires that the wines are aged for a minimum of 30 months, twelve of which must be in oak. According to wine legislation, the typical cultivation area for Sagrantino di Montefalco includes the Municipality of Montefalco and part of the municipalities of Bevagna, Gualdo Cattaneo, Castel Ritaldi and Giano dell'Umbria, all situated in the province of Perugia. 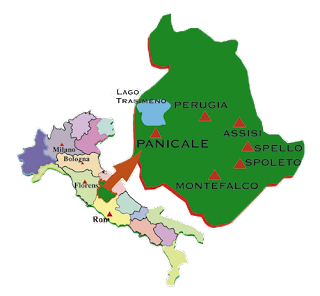 These areas are located in a basin of the Apennine Mountains, which receive warm summer temperatures, moderated by a mix of sea and mountain breezes. The sloping landscape is made up of soil composed of clay and sand, over limestone, and tends to be relatively rich in organic matter. There is also the Montefalco Rosso D.O.C. which is mostly Sangiovese, but can contain up to 15% Sagrantino. 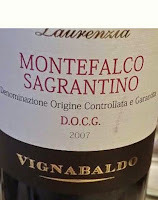 And, there is a small production area known as the Montefalco Sagrantino Passito D.O.C.G., that is worth seeking out, because the quality of the wines is, to my mind, one of the worlds most delightful. Sagrantino is an Italian grape variety that is indigenous to the region of Umbria in Central Italy. 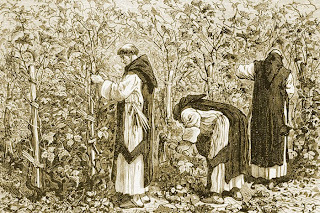 The origins of the grape are mysterious. Some think that it was brought to Umbria by the Greeks, while others say it was brought by the Franciscan friars. But the more “colorful” story has St. Francis of Assisi bringing it from the Middle East to be used as a sacramental wine. 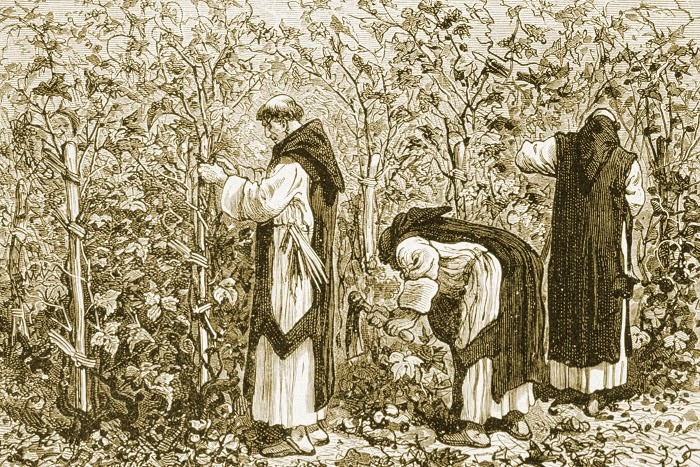 And that might be closer to the truth, as it is known that Sagrantino was initially used to make a dessert wine (sacramental wines were typically sweet). But, beginning in 1976, the wines were made in a dry style, and that is how they are primarily produced today. Sagrantino is a thick-skinned grape. The grape ripens late, but is resistant to both winter and spring frost. Sagrantino is generally harvested by mid-October or even later, to get perfect ripening. That thick skin translates into powerful, black colored wines, making Sagrantino one of the most tannic grape varieties in the world. The high tannins and affinity for oak mean that it matures particularly well. 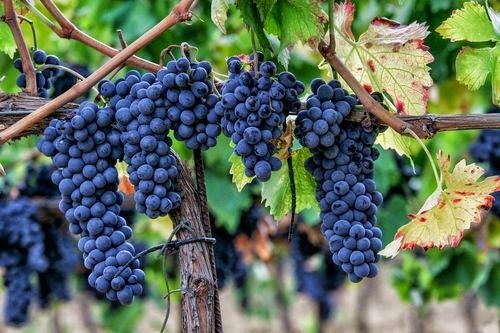 Since Sagrantino’s tannins are more sweet than bitter, an aged Sagrantino will often develop silky ripe tannins, making them approachable in youth. Remember, wine laws require 30 months of aging before release. These wines can age effortlessly for decades. Stylistically, these are dark, brooding wines, with intense black fruit flavors (black cherry black currant, and blackberry) with hints of plum, cinnamon, licorice, spice and a certain earthiness. Depending on the winemaker, the wines can be “jammy” and/or savory, with a quality that some associate with “pine tar”. Sweet AND savory! 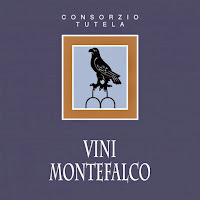 As mentioned, a passito style wine is still made in the Montefalco Sagrantino Passito D.O.C.G. These concentrated wines are made from semi-dried grapes (traditionally dried on straw mats). They would be comparable to Vintage Port in their intensity and longevity. The wine is a sweet, syrupy wine with raisin and blueberry qualities. The alcohol content is usually around 16 percent. Sagrantino is a food friendly wine that matches nicely with most Italian foods: Pizza, pasta, and anything with black truffles. They have the tannins to pair with wild game, braised meats, squab or pheasant, or even a nice steak or lamb. Of course aged cheeses go well too. Just remember to open the bottle and decant about an hour before serving. They go nicely with pastas or pizza. Add some truffles if available for a great match. Of course, the passito version is perfect with dark chocolate, dried fruits, or just sipping with a fine cigar. Outside of Italy, Sagrantino has been experimentally planted in Australia, California and Argentina. I have found interesting versions in California’s Central Coast. Mosby is one that comes to mind. 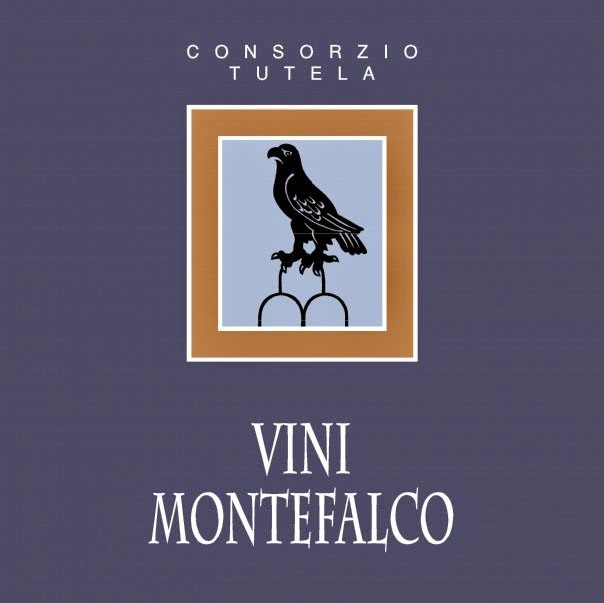 But, Montefalco is the true wine. As a final comment, when I passed my level III Sommelier Diploma exams, the few of us who passed, gathered together to celebrate. Each of us brought food, and a special wine to share. My choice for the celebration was a Montefalco Sagrantino Passito. I had been holding it in my cellar for a special occasion. So, Sagrantino has a special spot in my palate. I hope you will discover one of Italy’s most distinctive and powerful wines.